There is nothing like old fashioned apricot jam on a piece of toast with some cheddar cheese to top it. Everyone has their favorite way to dip into apricot jam and maybe you can suggest your favorite apricot jam treat for our readers. This jam has no added pectin but it thickens and is still soft. I was taught by a fantastic Mennonite baker many years ago that if you wanted to bake cookies with jam inside it was best to use jam that had no pectin because it helps the jam to not absorb into the cookie which makes your cookie hollow. So if you are planning on making jam jams this year for Christmas you may want to put up your apricot jam now. I store my jam in the freezer where it always tastes as fresh as the day it was made. If you want to store your jam in the pantry, it is recommended that you use a hot water processing bath. You will need 10 - 1 cup / 250 ml jam jars. Wash the jars and place them in a 225 F for 10 minutes to sterilize them. Sterilize the lids in boiling water. Combine all the ingredients in a heavy large pot. Stir together well and then turn the heat to medium high and stir until the sugar has dissolved and the mixture comes to a boil. Continue to boil the mixture. Set the timer to 30 minutes and stir every few minutes to be sure the mixture doesn't stick to the bottom of the pot. If your pot is a good quality you should have no problem with it burning on the bottom but if you are at all unsure, it is best to stir often to ensure all your hard work is not ruined by burned jam. At first the jam will foam on top but this will eventually go away and your jam will begin to thicken slightly. Put a small plate in the freezer and when the jam is near the 30 minute mark. Take the plate out after a few minutes and spoon a teaspoon of jam on the plate and allow it to cool. When the jam slowly drips down and has a thickened consistency the jam is finished. My jam usually takes about 30 - 35 minutes. Ladle the jam into jars leaving 3/4 inch space. Place lids and screw tops on the jars and cool. Once cool, store the jam in a refrigerator or freeze it. You make it all look so easy and yummy. This sounds like a great jam recipe for sure. I like using apricot jam as an icing on the sides of a layer cake and then sprinkled with chopped nuts! I can imagine how good it tastes on toast with cheddar cheese - I will have to try that! could you cut the recipe in half? Lovella is away today so I will respond. You can cut the recipe in half to make a few jars, but it most likely would lessen the cooking time. We do not generally test different variations in amounts,so if you try it, please let us know how it worked. Lovella, do you peel the apricots? That jam looks yummy; my Mom always made apricot jam; she would always add a few of the pits for 'flavor". Hope you're having an awesome summer, girls! Could this work for peaces too? Me again ... I have not tried peach jam without pectin, but it should work very much like apricots. You would need to peel the peaches. Stir often to make sure they do not scorch and test for jellying point with the cold plate... sooner rather than later. You can always put the pot back on the stove if not cooked long enough. Peaches will work but you need to skin them (cut a small X in bottom, dunk in boiling water for a minute or two then cold water to slide them off). I just made several quarts of apricot freezer jam with very little sugar and also froze lots. The skin may taste a bit bitter if frozen so by blanching the fruit in boiling water for one minute the skin slips off easily. Leaving the seed in during freezing definitely will result in a bitter flavor. My goal in just freezing the fruit with ascorbic acid (vitamin c) to keep the color true: making jam later when it isn't so hot, and also having fruit for cobblers, smoothies etc. Our neighbor had TONS of apricots this year; I couldn't face gallons of apricot jam ! I've had so much trouble making apricot jam the past few years. I don't think I've changed anything in the way I make it but each year the result is the same. Itthickens up nicely and tastes great but a few months later it forms sugar crystals in the sealed jar and I end up with unpleasantly crunchy jam. I've always used pectin so I think I'll try this method and see if it works for me. We do love apricot jam. If you have sugar crystals on the side of the pot and scrape the sides when filling your jars, you will be putting crystals into the jars which will form more crystals - remember your Grade 6 Science Experiment? I generally heat the fruit till it starts to give up some juice and then add the sugar in a steady stream into the centre of the mixture and am careful not to stir the sugar up onto the sides of the pot. Hope this helps. The price of apricots per lb puts them out of reach here even for a small bag to eat. I wonder why they're so expensive. I'm told they won't be coming down. I don't recall this other years, although I don't jam, I do like to buy a few times just to enjoy. These pricey apricots are also the size of peaches! Frankencots. 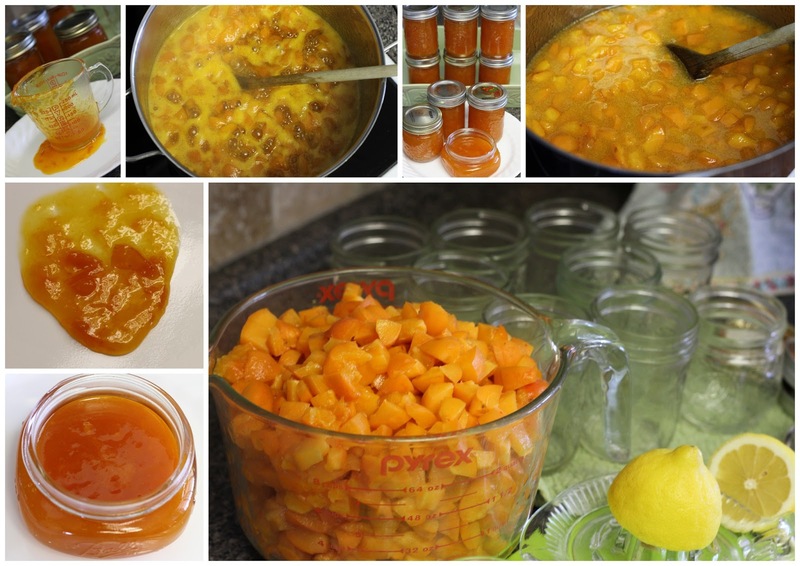 Hi, what are the steps if you freeze the apricot jam? Anonymous, maybe you missed it that the recipe is written out for refrigerating or freezing. If you want to store your jam in the pantry, it is recommended that you use a hot water processing bath. Apricot jam has always been my favorite on buttered toast. My Mom makes it every year. I suppose I better learn how to make it. Thanks for putting this up. Sorry, a tablespoon of vanilla bean paste. Elizabeth, where do you get the vanilla bean paste. I haven't been able to find it anywhere. I am going to use this recipe tomorrow...excited to make the jam without pectin! Can you double/triple the recipe in one pot or do you have to do it one recipe at a time? I'd like to try it with the vanilla bean paste but don't know where to get it. I've looked at Save-on-Foods, Safeway, Walmart and Superstore and no one has it. If you are asking Elizabeth where she finds vanilla bean paste, try replying to her comment by clicking on REPLY right under her comment and then she will see it. I don't know where you would find it either. You could buy vanilla beans and slit them in half and scrape the paste out. I tried this yesterday with some lovely late-season Niagara region apricots (my FIRST experience with jam making) and it was absolutely perfect. Tastes just like my Oma's used to (and that with the tree-ripened apricots from her backyard tree), and even gelled a little bit better than hers (and she used to use Certo! I stuck with no pectin and the consistency is amazing). Thanks Lovella! This will be my go-to recipe for apricot jam now.